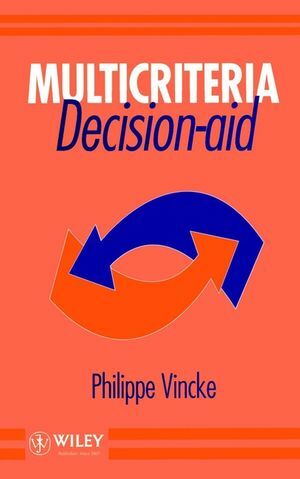 Decision-aid Philippe Vincke Université Libre de Bruxelles Over the past decade the discipline of multicriteria decision-aid has been extensively developed in the world of mathematics. As its name indicates, multicriteria decision-aid aims to give decision-makers a tool which should enable them to advance in solving decision problems where several points of view must be taken into account. Written by one of the leading authorities in the field, this book provides a unique introduction to the foundations, models and methods of multicriteria decision-aid. Challenging the monocriteria decision-aid approach to problem solving, Vincke presents us with a unique book which deals with preference modelling, the multiple attribute utility theory, the outranking approach and interactive decision-making methods in the same text. Multicriteria Decision-aid is directed at graduates and postgraduates studying in the fields of management, operations research, decision analysis and all those who, in business and administration, wish to take part in decision-making through scientific reasoning. About the author Philippe Vincke, author of two books and some 60 papers in preference modelling and multicriteria decision-aid, is currently a professor of statistics and operations research at the Universite Libre de Bruxelles. He is also the vice-president of the Belgian Operations Research Society, chairman of the International Committee for Summer Schools in MCDA and a founding member and first chairman of the ESI group on MCDA. The Basic Concepts of Multicriteria Decision-Aid. Index to Main Subject Areas.